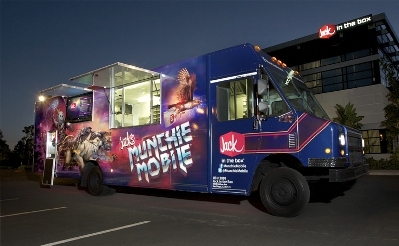 Last Friday, another food truck hit the streets of San Diego: the Munchie Mobile, proudly owned and operated by Jack in the Box. Perhaps it is unsurprising that a fast food giant has finally jumped on the mobile-meal bandwagon, but it still feels like a betrayal of sorts. Aren't food trucks supposed to be independently owned and operated? Little pockets of indie-awesomeness drifting through the city? The underdog for which we fight and feast? Maybe not. 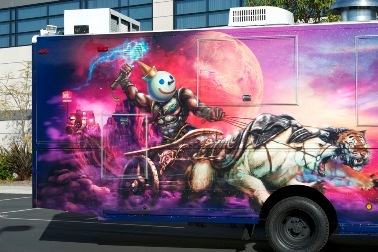 In an interview, Jack in the Box spokesman Brian Luscomb said, "Food trucks are a popular trend these days... and our guests have been asking, 'Why doesn't Jack offer a food truck?' So we built the biggest and baddest food truck we could possibly imagine." And oh, is it bad -- in the best possible way. Featuring a larger-than-life Jack, clad in shimmering armor, in a chariot drawn by a snarling polar bear and tiger (do you think he knows Charlie Sheen? ), set against a fantastical backdrop of a off the cover of the best sci-fi or fantasy novel. The Munchie Mobile will be meandering around Orange County over the next few months, ultimately migrating to Los Angeles this summer.